Before I started reviewing books online I loved rereading my favourite SF/Fantasy books. Since I don’t have time to do that anymore, this column is a trip down memory lane, where I’ll rave about books I love to read. And then read again. These aren’t reviews, as I won’t necessarily mention criticisms, they’re my chance to fan girl about books I love and hopefully garner some interest in some older titles. In retrospect it’s a bit odd that I picked up the Death Gate Cycle. 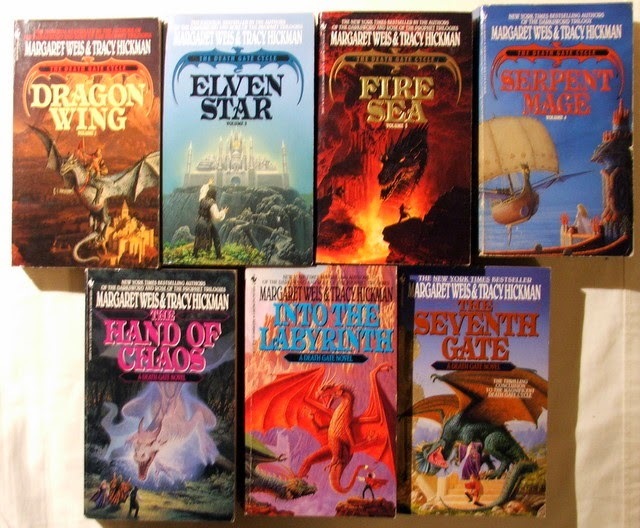 I’d read, and had a wildly negative reaction to, their Darksword trilogy and while I really enjoyed the Legends trilogy I thought the Dragonlance Chronicles were simply ok. But I found myself in a Coles store at my local mall as a teen and they were having a buy 3 get 1 free promotion. And there on the shelf were 4 books of the Death Gate Cycle. I was tired of waiting years for follow-up books, so this was perfect. I’d get all the books, one free, and not have to worry about waiting to read the end of the story. It turned out to be a good thing that I bought those books together because I enjoyed the first book, Dragon Wing, but didn’t love it, and found the second one, Elven Star, kind of boring. What I liked about Dragon Wing was the banter between Alfred and Haplo, the two protagonists. Well, they don’t meet up in book 2, in fact, Haplo’s the only character to carry over from book 1, so it didn’t feel like a continuation of the story. But I’d bought all 4 books and I was going to read all 4 books, so I picked up Fire Sea. Fire Sea not only brought the protagonists back together it did so in the most interesting setting, a lava filled world of stone where in order to fix the depleted population, those remaining started resurrecting their dead. With horrible, unforeseen consequences. From that book on I loved the series. I whipped through Fire Sea and Serpent Mage only to discover… that there would be more books in the series. I didn’t even know how many books, just that the story wasn't done, because while Dragon Wing and Elven Star had decent wrap ups, both book 3 & 4 ended on cliffhangers. So, I ended up waiting 3 years for the series to finish. At the end I loved the complexity of the series, how things brought into books 1 and 2 became important in books 6 and 7. I loved the interplay between Alfred and Haplo, the idea that you have to make decisions for your own life and then stand by them and accept the consequences, good or bad, for those decisions. I liked that the bad guys had actual grievances and that the so called good guys didn’t necessarily have the best interests of others in mind. The protagonists had to make some very difficult choices. The world-building was pretty awesome too. It’s a series I’ve reread numerous times and I’m still impressed by how the authors pulled it all together.